Even if you are not a rocket scientist, you are more familiar with the “wonder metal” Titanium than you realize. Titanium forged as metal is used to manufacture sports helmets, bicycle frames, computer components, dental implants, surgical instruments, joint replacements, automotive, marine, jewelry and aircraft equipment. Found abundantly in the United States and Canada, the ninth most abundant mineral on Earth is the element Titanium (Ti). This wonder metal is also found in the African countries of Sierra Leone and South Africa, Russia, Australia, Malaysia and the Ukraine. The name of the element derived from the Greek Mythos of the Titans is fitting: Titanium possesses 45% more tensile strength than Steel which is quite remarkable considering it carries twice the weight of Aluminium. This strength increases tremendously when Titanium is alloyed with other metals increasing its ability to withstand high temperatures and be extremely resistant to corrosion. Titanium is also one of the elements found in the Sun and meteorites as well. Evidence of titanium oxide is prominent in M-type stars. The Apollo 17 lunar mission recovered rocks that contained 12.1% TiO2. On planet Earth, titanium is present in the human body, plants, in minerals such as sphene, iulmenite and rutile, as well as in the ash of coal. It is the form of Titanium Dioxide (Ti02) which represents more than 90% of the world's demand for this metal. Ti02 is used for its brilliant whitening properties in many everyday products including; house paint, food stuffs, cosmetics, sunscreen, coated textiles, printing ink and ceramics. Approximately 40 percent of titanium production can be attributed to paper manufacture to enhance its opaque quality as well as process used to make plastic products. The same pigment is used in solar observatories as a reflector of infrared light to improve viewing conditions that are hampered by solar heat. In its purest form titanium dioxide appears clear with a higher refraction index than a natural diamond. Although man's discovery of this element dates back to the 18th century, it was not until the 20th century that its qualities as a metal and potential for industrial use became well-known. In 1910 the pure metal was made available by Hunter after heating TiCl4 with sodium in a steel bomb. However even with this advancement, the extensive qualities of titanium metal remained a mystery until 1946 when Kroll, reduce titanium tetrachloride using magnesium and revealed the method that would allow the commercial production of titanium which is still in use today. Purifying the metal is accomplished by decomposing the iodide. The choice of metal used in an alloy with Titanium create different grades of the composite metal and also dictates how it is used. For commercial use, 99.2% pure Titanium is used. For industrial or aerospace purposes, the alloy is 90% Titanium, 4% Vanadium and 6% Aluminium. This is the basic composition used by the jewelry industry as their starting point for designing Titanium jewelry with gold, silver, platinum and gemstones. 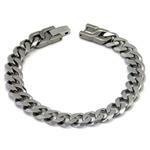 The total amount of Titanium in a jewelry item will vary and can be of any amount. It is the strength, corrosion resistance and bio-compatibility of Titanium that gave birth to the global Titanium industry. Today along with Aluminium, Iron and Magnesium, Titanium is the fourth most highly used structural metal for manufacturing products: the information technology, aerospace, military, sports, medical, jewelry and automotive sectors use of this metal extensively. For example, the marine industry utilizes the corrosion resistant quality of this metal to manufacture the rigging and propellers of ocean vessels. In addition, because of its resistance to salt water, titanium has potential use to convert sea water into fresh water. Wherever metal strength, heat resistance and lightweight qualities are required, titanium alloys are the first choice. Aerospace, military and law enforcement applications include the manufacture of the Boeing 747 where approximately 40,000 pounds of titanium alloy is used. Titanium is employed for the manufacture of weaponry, helicopters, missiles and vehicles. This type of usage also extends to the modern automobile manufacturers of the Porsche and Ferrari both use Titanium for engine parts to decrease the weight of the vehicle and improve its performance. General Motors was one of the first major companies to test the strength and performance capabilities of Titanium using it to create the body of the 1956 Firebird II automobile. Using Titanium for the body of this vehicle was also a good choice because most organic and industrial chemicals have no effect on this metal. This corrosion immunity is the result of a thin, highly-protective layer of Ti02, which automatically restores itself if damaged whenever water or air are present. What is even more impressive than these outstanding qualities, is the fact that Titanium is non-toxic; everyday humans consume quantities of this element without any ill side-effects. As one of the few bio-compatible elements on the planet, it has been safely used in medical procedures without any allergic reaction. In many cases titanium in its pure form can be used to make orthopaedic and dental implants, it is usually alloyed to either aluminium, iron or steel to improve the strength of the finished product and decrease its weight. In addition, individuals with Titanium implants are free from danger during medical testing such as MRI. All of these factors combined sums up the basis for the popularity of the use of this metal in jewelry craft. The presence of titanium receives the credit for the asterism of Star sapphires and rubies. 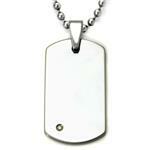 It is the use of TiO2 that allows jewelry to be colored without any allergic reactions. 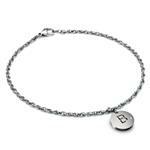 Although titanium is considered a white metal, in its natural state, titanium has a grey color. Unlike gold, titanium can be used its pure form. 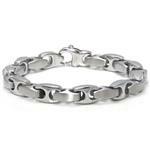 Titanium wears the crown as the hardest natural metal on planet Earth, yet this metal is 100% hypoallergenic. 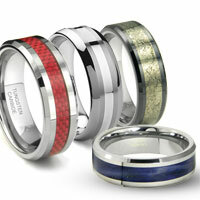 In jewelry craft, titanium has a unique quality that allows it to be easily colored to any hue. 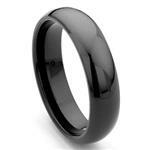 Especially for the crafting of jewelry rings, titanium is the ideal metal for it's longevity. 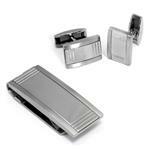 This metal is more scratch, dent and bend resistant than platinum, silver or gold. The other advantage titanium holds over these traditional jewelry metals is its weight; wearing a titanium ring with a diamond setting will feel much lighter than the same design in either 18kt gold or platinum. However some of the outstanding qualities of titanium create challenges for jewelry designers; titanium's natural hardness takes a heavy toll on the tools used to create jewelry. 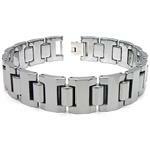 It is also the hardness of titanium that prevents it from being soldered. Soldering, a process where two or more metal items are joined together using a melted filler metal into the joint, is used in the manufacture of the majority of traditional jewelry items. 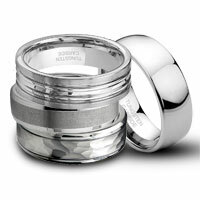 The other limitation is that titanium rings cannot be resized. In addition when working with titanium, certain types of jewelry items such as rings with prong settings are restricted. 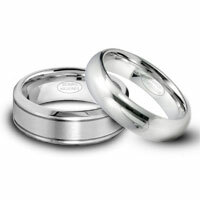 Most titanium rings will have parallel bands instead of tapered bands. 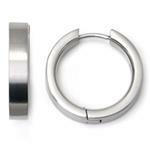 When a prong setting is desired a gold bezel setting can be added to a titanium band. However even with the higher labor costs to produce titanium jewelry, the cost of titanium is in many cases its redeeming factor. Titanium is less expensive than 9kt white gold and with its durability, strength and light weight factors, titanium has quickly become fashionable metal for it's style and beauty for engagement or wedding rings available in widths from 3mm to 10mm. Natural or colored titanium jewelry rings can be polished to a 'satin' finish adding a unique textured appearance. Not only can titanium rings be colored to a wide range of hues, they can also be engraved, carved, sculpted and combined with other metals such as palladium, gold, sterling silver and platinum. 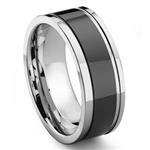 Another variation of titanium jewelry rings uses both natural and colored titanium metals for a distinctive look. For women and men desiring a modern alternative to the traditional metals of platinum, gold or silver used to create jewelry, titanium is the obvious choice. Individuals who seek to have their engagement and wedding rings custom-designed can include symbols, motifs and style elements that make their jewelry choice an original statement of their personality. As one of the first online jewelers to offer titanium wedding rings, today Titanium Kay continues to lead the way with innovative styles of high quality titanium jewelry for women and men. Featuring jewelry designer collections that incorporate a wide variety of metals, gemstones and other elements such as ceramics and leather that express their lifestyle perspective. 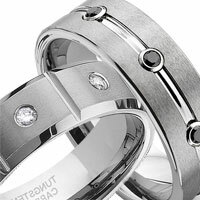 The full range of titanium wedding rings, wedding bands, bracelets, pendants and accessories can be viewed at http://www.titaniumkay.com.